This is an amazing historical piece featuring one of the Country's most popular Presidents. 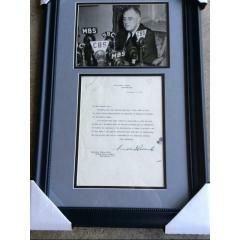 This unique release is a Franklin D. Roosevelt Historical Framed Presentation with a Signed Letter and Vintage Original Wire Photo. 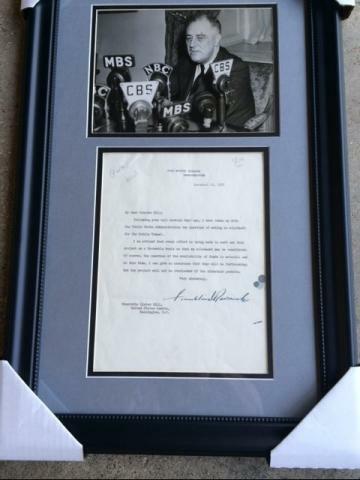 This spectacular framed photo presentation includes a typewritten letter which is signed by Franklin D. Roosevelt, as well as a vintage original wire photo. 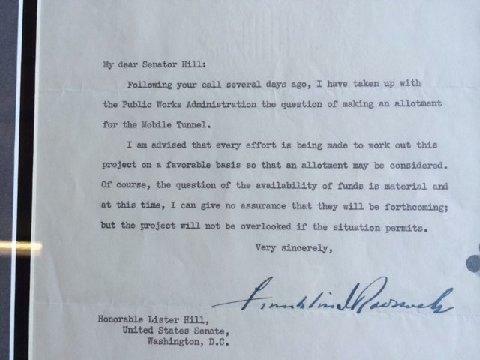 The signed letter is an explanation of FDR’s conversations with the Public Works Administration regarding a funding allotment request of Senator Lister Hill for a Mobile Tunnel. Even as governor, FDR believed that public works projects were "the greatest source of hope for the future?. Get this very special piece of history today. Franklin Delano Roosevelt (FDR) served as the 32nd President of the United States and the only President elected to 3 terms in office, although he died before completing the third. Energized by his personal victory over polio, FDR used his persistent optimism and activism to renew the national spirit. With his campaign theme “Happy Days Are Here Again,” FDR quickly spearheaded major legislation and issued executive orders that instituted the New Deal --- a variety of programs designed to produce relief through government jobs for the unemployed, and reform of Wall Street, banks and transportation. Due to the truly unique nature of this offer we must charge your credit card for the full amount immediately upon taking your order. This policy ensures we reserve the piece for you. We will confirm your order by Email. Please allow at least 2 weeks for delivery.